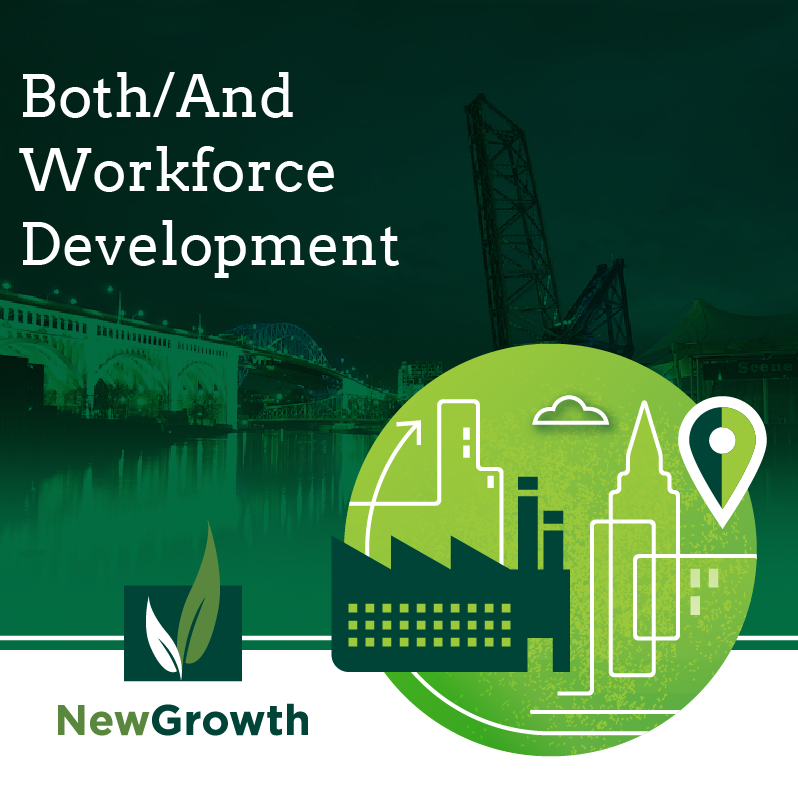 Throughout our years in workforce development, we have seen programs and initiatives focused on either supply-side or demand-side. In this dichotomy, supply-side programs focus on the process of training and supporting job seekers or incumbents, and demand-side initiatives focus on organizing employers to address their talent challenges. While it should be noted that programs are rarely only supply or demand facing, the focus on who the program is seeking to serve (job seekers or businesses) can lead to siloed systems with limited information flows. To address this, investors, policy makers, project directors, and other key stakeholders may consider moving from an either/or approach, to a both/and. As investigated in our Place Matters white paper, we found that those places that are thriving not only have talented workforces, they have employers who invest in and have opportunities for their employees. To create this mutually beneficial ecosystem, work is needed on BOTH the supply AND the demand side. In our work around the country we have found a number of innovative programs and initiatives which work to address the needs of both job seekers and employers. While these initiatives differ depending on local context, they share a few defining characteristics. Employer-led programs consider businesses as an end customer of workforce development and give employers the support they need to build the talent pool to fill positions. These programs are often led by a large employer (Toyota or IBM for example), who organizes others in the field or its supply chain and engages with community colleges and high schools to create industry-aligned career competencies. This ensures that area students are developing the skills needed to fill the demands of the labor market. As the return on investment is proven, businesses take on the cost of training. This may entail providing students a living wage while they are in training, bearing the cost of their tuition, or paying a fee to a non-profit or community organization who oversees the program. When employers are in the driver seat and a program shows a positive ROI the result is a pathway to the middle class for students and job seekers. Another hallmark of Both/And workforce development programs is support from policymakers. This support often takes the form of seed or sustaining funding as part of a budget allocation but can also take other forms as well. In Colorado, Governor Hickenlooper’s administration has supported a number of innovative initiatives including providing a portion of the seed funding for a new Swiss-style apprenticeship program. Other programs are working with career coaches to create evidence-based practices for helping job seekers and identifying policy levers to improve services. In Kentucky, the Cabinet for Economic Development views KY FAME, an employer-led training initiative, as an attraction and growth strategy and has worked with the community college system to expand the initiative across the state. Taking on a both/and approach to workforce development requires a shift in mental models and investment. However, a number of programs and initiatives are showing a return on investment for both private and public dollars, and promising evidence of advancing job seekers and incumbents into sustainable career pathways with family-supporting wages. Are you ready to take on a both/and approach to your organization’s workforce programming? Call one of our experts today to get started on resource and strategy development.